Ms. Lobsang Dolkar, PGT Economics delivered bi-monthly teacher’s talk on Self Discipline. She highlighted on various aspects and importance of maintaining Self Discipline. Yearly Riglam workshop was conducted for the teachers under the leadership of our philosophy teacher, Geshe Thupten Namgyal la. The workshop was imparted to various classes of Tibetan teachers, English & Social teachers, Math, Science and Commerce teachers by 4 Geshe la from Sera Monastery. The workshop concluded with the Riglam display from each class. Education Director graced the occasion. TCV Education Director, Mr. Sonam Sichoe paid week long official visit to our school. During his stay, he conducted inspection to classes, resource rooms and Laboratories. He addressed the staff members, students and students’ council separately. As a part of initiative by Education committee under the Department of Education, CTA, Member and Ex-Principal of CST Bylakuppe paid a visit to our school for two days. Madam carried out extensive inspection of various laboratories, resource rooms, hostels and homes and also undertook observations of few classes. She addressed the students and teachers separately. Three students each from four sections of Class VII and VIII took part in the contest. Each student performed poem recitation. Mr. Dawa Dhondup briefed the staff members of Junior and senior section on Secular Ethic based on the workshop attended during late February. Genla had an interactive sessions with staff members by engaging us in various activities. Genla mainly focussed on methodologies in imparting lessons on Secular Ethic to the students. The idea of having open day in IISc was suggested in 1948. The first ever open day was held on 3rd March 1977. It is an event held by IISc to showcase its activities to the student community and the general public held on 23rd March 2019. We were allowed access to the entire campus and even got a change to sit in the lecture halls and see a class being held. The Chemistry department had a display on countless experiments and we had lots of fun seeing those demonstration. We also visited the Biology department with its display on neuroscience and played several interesting brain games too. In the physics department, we visited nanoscience, practical physics and aerospace engineering buildings. On the whole, the trip was enjoyable and educational at the same time. We got an opportunity to have conversation with resident scientists of the institute. 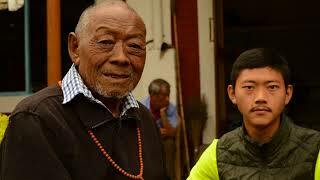 The only shortcoming was that there were no other Tibetan students expect us. So, we strongly urge that our students need to build up more curiosity towards science.